Making Galleries accessible to people with disabilities. Mentoring a trainee arts facilitator. 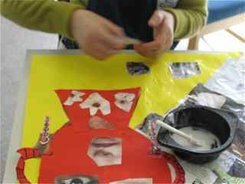 To design and deliver appropriate, accessible, inclusive art workshops based on the gallery exhibits. From Deaf Blind Cymru and Conwy Council Learning Disability Day Centre. The Mostyn Gallery employed a range of artists to work with a group of Deaf Blind Cymru members. The artists delivered workshops in creative writing, textiles, sculpture, painting, mixed media and ceramics. To mentor the artists and empower them to adapt their workshops, making them accessible to the group. Provide reflective, supportive discussion following each workshop. 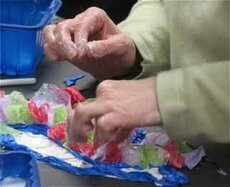 Provide advise to the gallery and charity around working with the visual arts with people with people who have duel sensory loss.